6:58am – Callback from lice professionals. I had left a message at 11pm last night, freaked out that my sis-in-law’s family had lice and we had basically spent the weekend braided together. I checked my kids and found nothing, but smothered them with lice repellant regardless and barely slept, sweating rosemary and mint all night. Our appointment is at 9:30am. 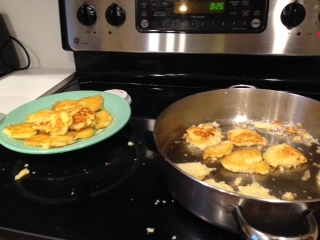 7:30am – Frying up latkes for middle child’s class for Hanukka party we would no longer be attending. Still, the latkes must go on, with or without us. 8am – Call to wake my father for doctor appointment that he already missed once and had issues you don’t want to know about, the second time. Bless the stars, he is awake. 8:30am – Frying, making breakfast, calling schools, freaking out over lice which I cannot see but know is there. 8:40am – Middle son runs in with finger gushing blood. 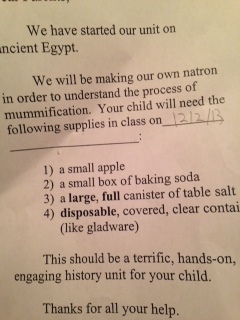 I think it’s a joke from the magic kit we got them for Hanukka. “That’s not real blood.” I laugh. Yeah, it was. 8:45am – Call from dad alerting me that he would be missing appointment again because boils have broken out all over his body. Seriously. Boils. Blood. Lice. It’s officially the plagues. 9:30am – Without a trace of hail in the sky, we make it to lice professions. Whew. Boy 1 checked, pronounced clean. Mommy checked, clean. So they say. Mommy lays with boy 3 every night at bed time. 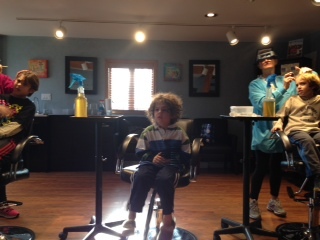 Noon – Scratching the invisible bugs in my brain, we leave lice professionals cleaned of nits and cash. Drop latkes at co-class mom’s house for afore mentioned party, pick up library book for oldest son, pizza place and home. 1 -2:40 – Laundry to sterilize every fabric in house. 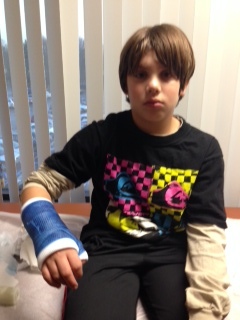 3pm – Orthopedist for oldest son who hurt his hand a few days ago and is still somewhat swollen. We figure we should check it out. 4pm – Hello irresponsible parents. It’s a fracture. Cast applied, child and mother miserable, Coach Dad inconsolable. 4:30pm – Father at primary care doctor for boils who offers up this bit of brilliance, “Wow. No idea what that is!” Appointment with specialist secured. 5pm–8pm – Missed homework, dinner, never-ending laundry marathon continues. Suffocate all stuffed toys in garbage bags. Find children rolling on top of one another playing. Freak out and spray them like crazy with lice repellent. Near blinding occurs. “You forgot Hanukka presents!” Cry boys 1,2 & 3. Run up to get gifts, run back down. Hurry through prayer and candle lighting. Throw gifts at them. It’s all extremely meaningful. Boy 3 – A small nod of happy. Yay. We can still make the 5 year-old happy. That’s almost thanks. Kind of. 8:30-9:30 – Lice shampoo all little heads. Pull UV light off lizard tank for better view while combing. Identify questionable dots of brown. 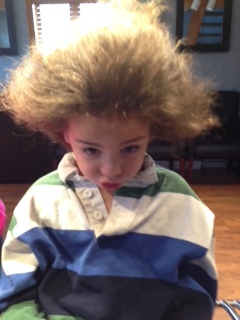 Could be 8 year-old cradle cap or nits. 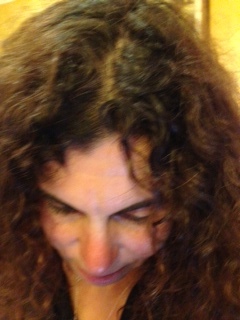 Beat husband with lice comb. 9:45 – Children asleep on newly made up beds. 6th load of laundry goes in. 10:45 – Sitting here writing this list, getting ready to shower and lice shampoo my head. Feeling about 100% confident that tomorrow will be filled with combs and shampoo and stress. I am totally bugged out. Posted in Crap that makes me eat too much ice cream and tagged a bad day, alexander's terrible horrible no good very bad day, boils, lice, one of those days, parenting, plagues. Bookmark the permalink. Oh the lice episodes! I feel for you. It could have been worse though – 4 little girls with hair down to their waist! you’re so right. it’s been a week today and i’m still a little bit in crazy town. i just can’t feel 100% confident, no matter how many times i comb. bleeehh!! This was a good one. Sorry you had a bad couple of days! Holy crap! I’ll have a drink for you. exactly. it was actually even worse that i wrote. i know! Okay…I’ll have TWO drinks for you. you are sooo good to me! Lol. It’s a tough job supporting you like this, but you deserve it! Oh no, what a day!! 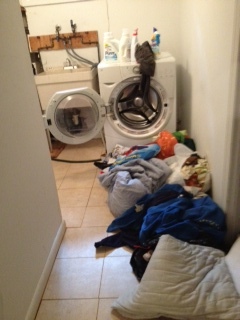 On the bright side, at least you have a functional washing machine. Just think . . . nevermind, don’t think about that AT ALL. You might have a breakdown. Just think happy thoughts. Momming is fun, no? Jack looks like a champ and ..You got all the bugs out!!! All good from here on in!!! Lice is heinous!! You sound like you’ve been through this before! Ugh! it’s the first time we’ve ever actually had it!! Why wouldn’t this happen in Australia ? it was a reference to the Alexander’s terrible, horrible, no good, very bad day book. Lice are my worst fear!! I have so much hair and I have never gotten them before and I just KNOW my kids are going to give them to me!!! I know it. Freaks. Me. Out. it should!!! i swear, i’ll never feel clean again!! Lice is really the most vile of all the four words that exist!!! Glad that no little bugs have joined your family yet, sending good thoughts that it stays that way!! well, bedbugs are actually worse.. but thanks for the good thoughts. that was a week ago, and i’ve been vigilant!! haha! it was definitely one of those days!!! thanks! Yikes, what a day. My head was getting itchy just reading this. no kidding! i’m scratching at the air around my head! Dude. I am dying for you. DYING. God bless you! thank you! it’s been a much brighter day. I love that story and I totally got the Australia mention. Sorry you had such a terrible, horrible no good very bad day but it did make me smile. I could just hear the story in my head as I was reading this. I read that story so much, I have it memorized. I love the part where the go by shoes and everyone gets what they want but him. Poor kid just can’t win. You had me hysterical throughout this post. Isn’t it great that life isn’t like this everyday, but on the days that it is, it comes to an end (and you get to beat your husband with a lice comb to get out your aggressions?) 🙂 Hope you had a happy Chanukkah! Let’s hope that next year, the plagues will only show up in the Haggadah! thank you. and yes! they’d better stay in Huggadah where they belong! haha!